From the moment we began to drive down the long tree lined drive, under the canopy of the majestic Live Oaks with hanging Spanish moss; I felt transported. During my first few days, I spent considerable time walking the beautiful grounds of Mepkin Abbey and I was struck by the brilliant diversity of the natural surroundings. Never had I seen such colorful dragonflies, lizards, frogs, grasshoppers and birds. They appeared to have been dipped in paint or was it some elaborate ruse with a wayward coloring set? Everywhere I walked, they seemed to sweep me along my intended path. The confidence in which the squirrels and birds went about their daily chores, indicated an ease and calm within the abbey itself; these were creatures unaccustomed to harried work and comfortable with the many visitors drawn down that same treed lane. At night we were serenaded by crickets and cicadas; while during early morning jaunts to vigils, the owls echoed our footsteps along graveled paths, beneath starlit skies. It all seemed surreal and other worldly at times. That was the setting that helped ease me into a routine of monastic life and helped me to gradually embrace the cocoon of silence which enveloped the Abbey. As time progressed, I noticed that my hurried steps, slowed; my nervous energy, waned and gradually I felt more and more relaxed and calm. I was beginning to hear and feel the rhythm of Mepkin. Unbeknownst to me, I was being molded by a monastic rule set in place long ago and was beginning to realize that it still resonated today, perhaps more than ever. 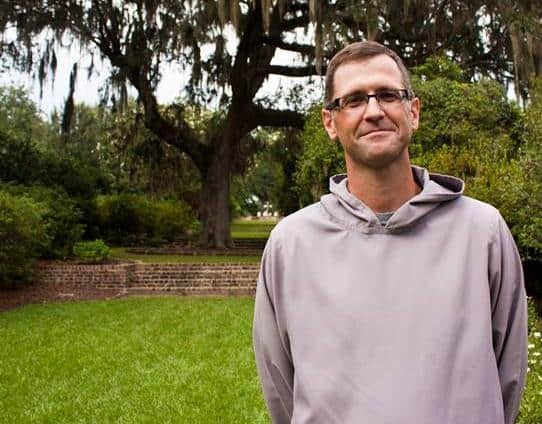 The monastic guest program at Mepkin, provided me with an opportunity to step outside of my own hectic life and afforded me time and space in which to be still and recharge my spiritual and emotional batteries. It had been in some ways an intensely personal journey, yet within the confines of a deeply committed faith community. One which followed a simple precept set down by St. Benedict, ora et labora; prayer and work. I felt as my time at the Abbey slowly unfolded, I began to view the monastic community in the same light as the many little creatures who inhabited their grounds; all were very interdependent. Each and every monk was valued and had a role to play in the running of the Abbey. Some were assigned as cooks, others washed dishes, some greeted guests, a few mowed lawns, some worked in the mushroom farm, others ran the gift shop, while still others presided over liturgical services. Yet they were all fellow sojourners, committed to prayer and work within a contemplative setting. It has been a tremendous and profoundly moving experience for me. One that I am not quite sure I can fully comprehend or process yet. I feel fortunate and blessed to have been allowed a brief glimpse into such an extraordinary way of life. I will carry it with me; I hope, as I return to my home in Canada. I know that my experience at Mepkin will influence some future thoughts and actions; hopefully, forcing me to slow down and enjoy being in the present. It may be in the little things, like turning off the t.v. or the radio and being still in the silence. I am sure I will remember on cold winter afternoons my quiet walks under the South Carolina Live Oaks, my path guided by brilliantly colored dragonflies and when in church in my home parish, I will hear the choir monks in my head, rhythmically chanting the psalms as they are being read.